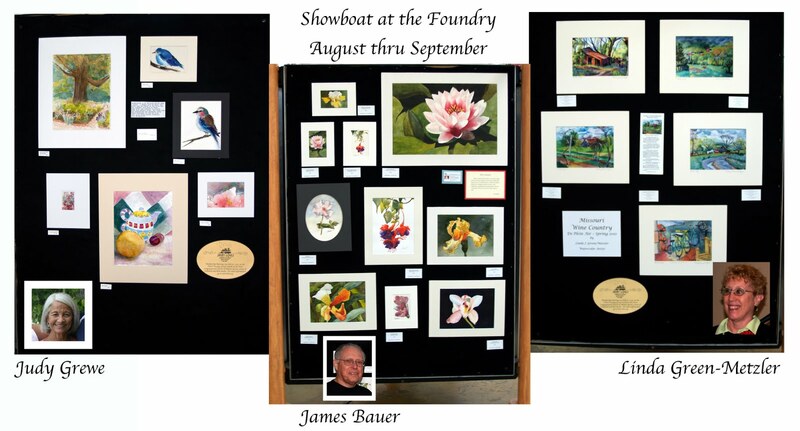 Now showing at our Showboat kiosk at the Foundry in St. Charles; Judy Grewe, James Brauer and Linda Green/Metzler. Special announcement, Linda Green/Metzler will be stepping down as chair of this venue and we need a new volunteer. The position requires booking the use of the space by passing a sign up sheet at regular monthly meetings (or a friend could do this for you), receiving calls about availability and then contacting the scheduled participants as a reminder. The venue chair then meets the participants at the Foundry on the change-out day, every 2 months, to oversee the retrieval and installation. The venue is booked through January 2012 and a new volunteer could observe the October or December installation process. Linda has it all in hand after over-seeing this venue for 4 years and she can pass on all of her knowledge. Please call Mirka Fette, 314-933-3135, or Linda at 314-469-3205 to volunteer for this important, but not too time-consuming, position. There is no specific term for this position – just whatever works for you.